In this post, scientometrics researcher and 2018 Altmetric Research Grant recipient Shenmeng Xu describes how the design of China’s largest social network, WeChat, may affect what we know about how science is communicated. Altmetrics sourced from social networks like Twitter, Facebook, and ResearchGate have been studied a lot to date. WeChat (微信), China’s largest social network, is different from the above-mentioned tools in many aspects, including the technological functionalities, user groups, languages used, among others—and in the fact that it is relatively unstudied among scientometrics researchers. With the growing number and internationalization of users, WeChat has become an important platform for scholarly communication, offering potential for big data insights to map and evaluate the communication of science in China. In this post, I describe the work that I and my colleagues have done to date to better understand how WeChat’s design and other factors influence how academic research is shared, which in turn can affect the volume and nature of WeChat-sourced altmetrics. What is WeChat and How is it Used to Communicate? WeChat was launched by Tencent in January 2011. According to statistics at the beginning of 2018, the number of monthly active users of WeChat has reached over one billion after seven years of growth. WeChat is used by many to chat and share content with friends (among many, many other kinds of uses), the private nature of which can make it difficult to track discussions around research. But there are other WeChat features that can be used to share and discuss research, which is what I’ll talk about in this post. WeChat Official Accounts (WOA)—also called “Gong Zhong Hao” (公众号) or “Public Accounts”—started as a WeChat service in August 2012. WeChat Official Accounts are content producers across all fields in life. The basic features of the WOA platform include broadcast messaging, auto-reply, menu editor, follower management, content management, direct messaging, analytics, and user surveys. In our research project, we focus on the scholarly communication happening on academic WOAs, among which the dissemination of scientific articles is one of the most important subjects. Academic WOAs disseminate scholarly articles in blog-like posts with their translations to Chinese, interpretations, and/or even commentaries of the articles. By studying scholarly WOAs’ sharing of academic articles and the behavior of their readers, we will be able to better understand the reach and impact of scholarly articles on WeChat, which is currently untraceable due to various reasons. In our study, we explore the barriers of tracking WeChat as an altmetric source, including technical barriers (based on the infrastructure and affordances), language barriers (mainly between English and Chinese), cultural barriers (about commenting and sharing behavior of users), and policy barriers (e.g., the content management of “external links”, see more discussion below). In this blog post, I will talk about some preliminary findings in our exploration, specifically about the different kinds of academic WOAs, how WeChat post links’ design can impact how they are shared, and the unique role that academic WOAs play in communicating research to broader audiences. More results and discussion will follow in our paper as our project proceeds. According to the WeChat website, there are currently two categories of WOAs: “subscription accounts”(订阅号), and “service accounts”(服务号), created for different purposes. Individuals can only register for a subscription account; businesses can have the option to run a service account after a series of verification procedures. However, the major differences of these two types of accounts lie in the quotas of messages they can send each month and the features they are granted for interactions with users (for instance, the permission to insert links in their posts, ability to customize menus, and support for payment, etc.). In the past several years, the categories of WOAs, as well as the diverse functions and permissions they are granted, have changed intermittently and is still changing. Academic WOAs can span a wide range of disciplines, including biomedical & health sciences, life & earth sciences, physical sciences & engineering, mathematics & computer science, as well as the social sciences and humanities. WOAs are significantly different from each other in the kinds of content they share, in addition to the different functions and permissions they have based on whether they are a subscription or service account. The content and professionalism of posts also vary. On the one hand, an academic WOA can be run by individual enthusiasts of a specific scientific discipline with a small number of posts (in this sense, more like an academic personal blog); on the other side of the spectrum, an academic WOA can be operated by a large team, consisting of not only professionals in academic sectors (scholars, publishers, and science communicators) but also other professionals (translators, social media specialist, marketing personnel, and technical support, etc.) In the latter case, WOA owners might additionally have their own official websites and mobile applications to communicate with readers; they might provide additional services such as conference connections, communications of recent technologies, research trend discussions, social and collaboration features, business opportunities, and so on. Examples of the larger academic WOAs in our investigation list include but are not limited to 科研圈, 壹学者, X-MOL, 奇点网, 机器之心, among others. For some of them, the WOA serves as an extension of the means of marketing and communicating their other services. All in all, the various types, permissions, and functionalities of the academic WOAs have made it more complex to collect data that fit within the scope of altmetrics. WeChat Official Accounts reside in the ecosystem of WeChat and follow the rules and regulations of WeChat. WeChat is known to block certain types of URLs from certain sources containing certain content. “External links” and “internal links” are treated very differently in the WeChat ecosystem. Internal links link to content posted by WOAs, while all the other content can only be linked by “external links”. Some existing English articles (e.g., this one by Ashley Galina Dudarenok) have provided a relatively comprehensive introduction of the rules around inserting external links in WeChat. However, so far, there is not yet a precise English version of the external links content management specifications posted officially by WeChat, even on their own website. The majority of WOAs cannot embed external in-text links, which makes it more difficult for these WOAs to share links to research. Currently, the exceptions are: 1) “service accounts” that have both been verified by WeChat and have the “WeChat Payment” functionality activated; these accounts are granted the ability to insert both internal and external links in their posts, and 2) “subscription accounts” that have the “Copyright Protection” functionality activated are granted permission to insert internal links in their posts. However, the accounts that meet these criteria, especially the first one, are rare. As a result, the most common way to provide an external link in WeChat is probably to use the “Read More” option at the bottom of the post (see Figure, below). However, there are two major issues with the use of the “Read More” button. Firstly, only one link can be inserted as the maximum in a single WeChat post. This can be a problem when there are two or more sources that the content creators would like to cite, which is not in rare cases especially in academic posts. Secondly, the “Read More” button can only be located at the end of the post. Having to click on it at the end of the post can certainly interrupt the flow of reading and navigation. Worse still, sometimes the button can be completely overlooked. According to our interviews with academics, the reason why they do not always click on the “Read More” option is that they simply do not reach that far. The following two figures show an example of the end of an academic WOA post. This is an article in Chinese, authored by Jie Bai at Digital Science and Dr. Xianwen Wang at Dalian University of Technology, introducing and summarizing the “2018 Altmetric Top 100”. It is posted by the WOA of Lin Mo (林墨), a non-profit academic WOA run by a group of information scientists across multiple universities in China. 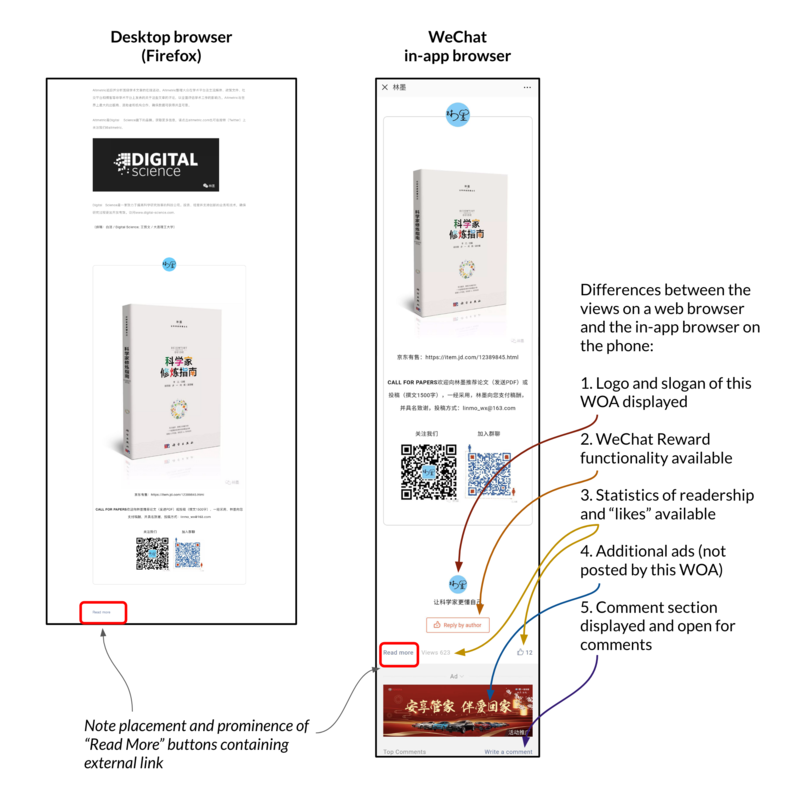 In the figure above on the left, we see the display of the end of an article on a regular browser; on the right, we see the same thing displayed on the WeChat in-app browser on a cell phone. For reference, the main text of the article ends just above the top of what can be seen in the Figure; the “Read More” button is marked in the two red boxes. As can be seen (in the left figure), on a regular web browser, the “Read More” button is separated from the main article by an advertisement of a book, a paragraph of “Call for Papers”, one QR code of the Lin Mo WOA and another of the Lin Mo communication group. On the cellphone in-app browser (as is shown in the right figure), the “Read More” button is additionally separated by the logo and slogan of the WOA, the WeChat Payment button, as well as statistics of readership and “likes”. In both instances, the distance between the end of the article and the “Read More” button is a little over two screens away. Additionally, on the cellphone, below the “Read More” button there are other advertisements and a comments section, both of which make the “Read More” button even more difficult to find. In addition to where the external links are inserted in the posts, rules about how and where external links are opened can also affect one’s ability to track URLs shared in academic WOA posts. For some types of external links, users are asked to open the external link in another browser instead of the WeChat in-app browser. In these cases, the users need to copy the link, open another browser on their phones, and then paste the link into the browser to be able to view the content. These links in a sense become “dummy links”—links that will never be followed because it’s too fussy to do so. Given the lack of academic social media platforms like Mendeley and ResearchGate in China, academic WOAs help to form and engage otherwise loosely-coupled academic online communities. A two-step flow of communication (Katz & Lazarsfeld, 1955; Katz, 1957)—whereby a message is interpreted and rebroadcast through an “opinion leader” to a much broader public—is observed to overcome the language barrier in the communication of academic articles on WOAs. Here, the translation or summarization work (mainly from English to Chinese) of WOAs shapes their role resembling the “opinion leaders” in the Two-step Flow of Communication model. 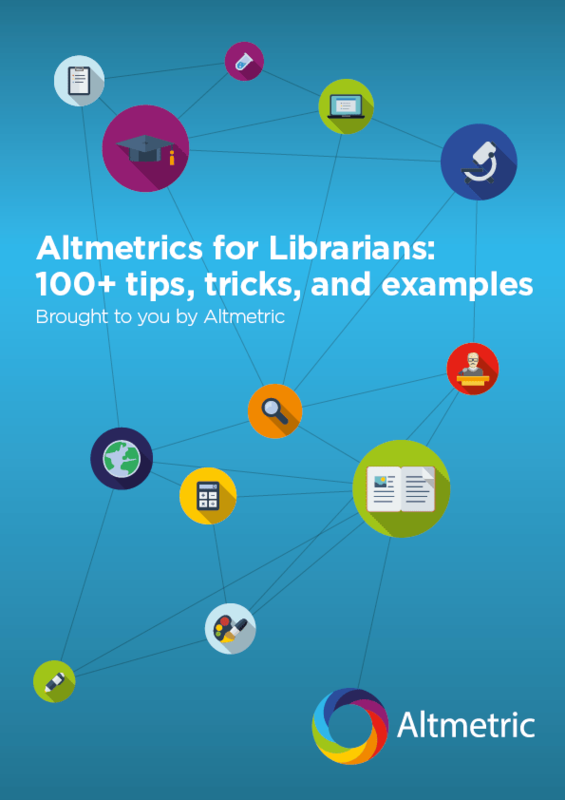 Currently, altmetrics research tracks and analyzes the mentions of research, usually academic articles, to look at their reach or potential impact. In current altmetrics research, the two-step flow of communication in the impact network is underexplored. For instance, an influential scientist mentioning an article on Twitter probably creates a larger impact than a random Twitter user posting the same article; but in both cases, they are analyzed and interpreted as “one Twitter mention”. Similarly, one mention of an academic article in a WOA post does not tell the full story of the impact of that work. The readership, likes, and comments of the WOA post can provide valuable additional insights into the reach and potential impact of the article mentioned in this WOA post. Based on our interpretation of the Two-step Flow of Communication Model as it relates to WeChat, my colleagues and I would recommend that any consideration of WeChat-sourced altmetrics includes not only tracking mentions of research in posts (i.e. dissemination by opinion leaders) but also broader readership and engagement metrics (i.e. the influence that the research has had more broadly). With WeChat data aggregators (e.g., Qingbo, which provide some partially open statistics of certain WOAs), it would be possible to integrate these data into the measurement of social reach and impact of academic articles on WeChat. Communication on WeChat is different from any of the other commonly used social media tools in the western world. Nevertheless, WeChat’s increasing user base has made it an important and powerful tool for online communication, and particularly, mobile communication. In the past years, WeChat has gone through rapid growth and transitions in many aspects. Rooted in a different legal and regulatory environment, facing diverse cultural and language barriers, academic WOAs need to be further studied, particularly in terms of openness, in order to better understand its role in scholarly communication mechanisms and thus the meanings of WeChat-based altmetrics. Shenmeng will present some of the preliminary findings at iConference2019this April in Washington D.C. To follow Shenmeng’s research into WeChat and altmetrics, please check her website for following publications. In our prior studies with Chinese researchers in Singapore, we observed that culture is a crucial aspect as most participants used platforms such as WeChat only for leisure and personal communication. However, they also indicated that they would disseminate academic papers in such platforms only when such an action is included as one of their job responsibilities!